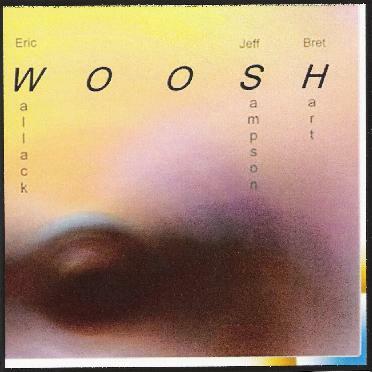 Eric Wallack/Jeff Sampson/Bret Hart - "Woosh"
I'm well familiar with the work of free-improv artists Eric Wallack and Bret Hart, though Jeff Sampson (piano/keyboards/synths) is new to me. The source tracks for this collaboration started in Massachusetts with Sampson, traveled to Ohio for addition of Chapman Stick by Wallack, and finished up in North Carolina by Hart adding guitar, organ, percussion, marimba, autoharp and sampled balalaika (and knowing Bret some of those are probably homemade instruments). "Kuan" begins with Sampson laying down a light keyboard melody, Wallack jamming on Stick, and Hart adding contrasting aggression on electric guitar. Wallack gets a nice funky groove going that works well with the keys. But soon the trio gel with one another, each playing along in his own little world, seemingly independent of the other, yet with a distinction that comes together very nicely. The 21 minute "Shikan-Taza" is next and begins with drone waves that create an ominous atmosphere, accompanied by whining, strained guitar effects and the Stick adding that all important groove. The guitar gets increasingly noisy and intense, which sounds really cool opposite Wallack jamming merrily away on the Stick. It sometimes sounds like Hart is going to bust out on guitar, which keeps the tension level high. But this is all about atmosphere and sonic landscapes, while at the same time having a dreamily jazz like jamming quality. The guitar can be a little harsh at times, but despite the noise elements the surreal dream world feel only becomes more powerful as the track progresses. "Pneuma-12" takes things in a different direction, being a spacey melodic keyboard dominated prog-light styled tune. "The Map is Not the Territory" is similarly in a prog rock style, but ventures down a more complex and interesting path. "Res Cogitans Uber Res Extensa" explores even more different territory, combining a light spacey jazzy Stick melody with vocals by Sampson and busy effects by Hart. It's a light dreamy song… but accompanied by experimental sounds bits. I quite liked this one. And the CD closes with "The Hylozoists", probably the most meditative and overtly jazzy track of the set. This was an enjoyable set of music. Very accessible music, particularly the last four tracks, much of which can be listened to as relaxation or closer considered listening. But even at its most accessible there are avant-garde bits that crop up, just in case anyone gets any ideas about how they might easily classify these guys. For more information you can visit: http://www.burningshirt.com/caustic.html.